MILK bottles will have a logo on them to tell customers where the milk was produced and whether the dairy farmers were paid fairly, if a new bill is passed through Parliament. 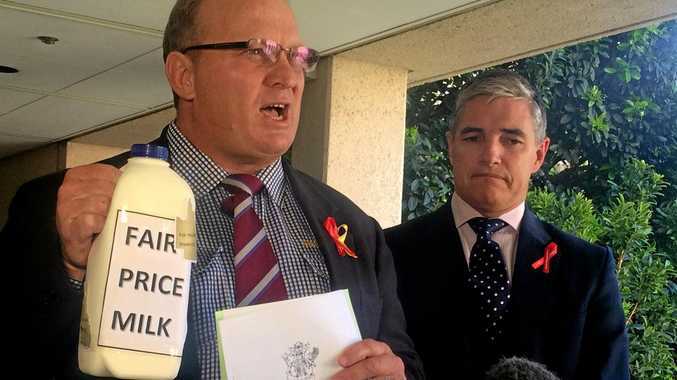 Katter's Australian Party Dalrymple MP Shane Knuth introduced the Sustainable Queensland Dairy Production (Fair Milk Price Logos) Bill On Wednesday, saying something needed to be done to address the continually-shrinking dairy industry. Mr Knuth said the number of dairy farmers in Queensland had been slashed from 1500 to 430 in the past 15 years because of deregulation, natural disasters and the $1 a litre supermarket milk price war. 37 dairy farmers in Gympie; 103 dairy farmers in Toowoomba; 34 dairy farmers in Warwick; 54 dairy farmers in the Scenic Rim/Ipswich region; 32 dairy farmers in the Sunshine Coast region; four dairy farmers in Rockhampton; and four dairy farmers in Bundaberg and the Fraser Coast combined. Mr Knuth said the new fair milk prices bill would set eligibility criteria to allow producers to place the voluntary logos on milk containers to show where the milk was produced and whether a fair and sustainable price had been paid to farmers in the production process. The bill also contains a mechanism for setting fair prices. "Queensland dairy farmers are in a crippling financial crisis, the deterioration climate of the dairy industry is making it crucial to pass legislation that will help keep dairy farmers afloat," Mr Knuth said in Parliament. On average, 70 farmers exit the industry every year, he said. If the trend continued, he said fresh milk would not be produced in Queensland from 2028. Mr Knuth said it did not force anyone to use the logo but would inform consumers about what milk they were buying. "The bill requires that a fair milk price logo identifies the region in which the milk was produced, as the cost of production varies from region to region." The bill will also require a decision to be made about a fair price for milk. Mr Knuth said many farmers had been forced to leave the industry when supermarkets reduced the price of their home-brand milk to $1 a litre. He said milk had not been that cheap since 1992. "No one can live on the same wage they did in 1992, however, dairy farmers are being forced to and simply cannot survive." The bill has been referred to the parliamentary agriculture and environment committee that will report to Parliament.